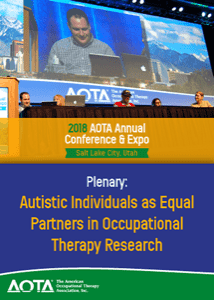 How can the field of occupational therapy lead in partnering with the autistic community where autistic individuals have a voice in setting the research agenda defining meaningful participation on their terms? We must first listen. This plenary brings together a panel of autistic self-advocates to address research issues central to autistic community concerns to set priorities, provide for authentic participation in the research process, and yield a truly client- centered research agenda.